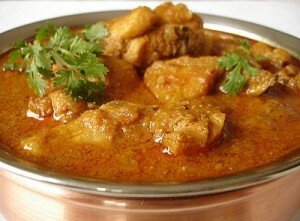 Cream Wali Murghi (Creamy Chicken Curry) recipe by maham at DesiRecipes.com. Simple yet easy Creamy chicken curry is loaded with flavors of chicken stock, cream and egg. Heat oil in a pot and fry onions till golden brown. Add chicken and cook until it changes its color, and water dries up. Add refined flour and cook for 5 minutes. Add 2 cups of chicken stock and salt . Turn down the heat when the stock dries and the meat is tender. Mix cream and 4 tbsp of stock in egg yolks. Beat well. Add to the chicken and cook for few minutes. Delicious creamy chicken is ready. Serve with boiled rice.